An addiction to alcohol is the same as an addiction to any other substance. You become dependant on it, and it receives the highest priority in your life. Everything else falls short. It is a destructive behaviour that destroys lives, and families. Excessive use of alcohol, to the point that your body becomes dependant on it. Alcohol becomes the most important thing in your life. Someone who has an addiction to alcohol will continue their habit regardless of the negative impact it has on all areas of their life. An alcohol dependant person may realize the negative effects, but it isn’t enough to stop them drinking. This kind of disorder occurs when you drink so much that chemical changes take place in the brain. Due to the changes in the brain, pleasurable feelings are experienced when you drink alcohol resulting in a domino effect. You want to keep drinking, or drink more, to maintain that feeling of euphoria. An alcohol dependant person will seldom worry about the harm their habit is causing. 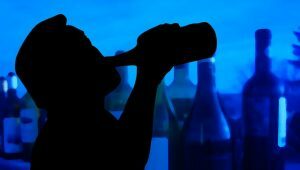 Over time that pleasurable feeling associated with drinking alcohol will no longer be there; however, the addict now has to continue regardless, in order to keep the withdrawal symptoms at bay. This is the cycle of alcoholism. As with any addiction, there are factors that may contribute to a person turning towards alcoholism, or not. This type of addiction has been know to run in families. Peer pressure, low self-esteem, and a stressful lifestyle are all contributing factors. Mental disorders are a common cause for alcoholism. Things like anxiety, or depression often lead to the disease. A man drinking more than 15 drinks per week, or a woman 12 is an indication that a problem is brewing. Binge drinking on more than 5 drinks on any given day is a short cut to alcoholism.